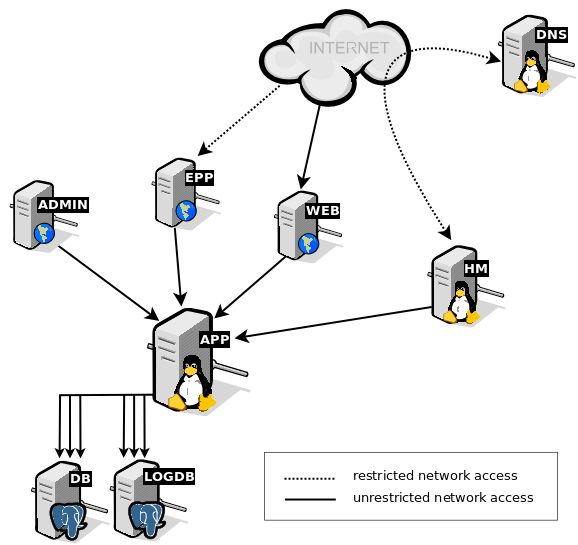 access control on the network level. Deploying on multiple physical servers is not the only distributed solution, deploying on virtual servers or separating tasks on the process level is also possible. Nodes in this document represent execution environments. (1, 2) MojeID and Domain Browser are CZ-specific extensions, and they are not described further. WHOIS includes both Unix and Web variant, and RDAP, too. the whole system can be replicated in several instances on different localities, which can substitute one another when one instance fails or during a system upgrade. Network rules are described further per node, but here is an overview of logical connections in the network (one instance). The port numbers mentioned in the network rules are settings of the default installation. Hidden master for the DNS infrastructure. Consider that the storage will contain files managed by the FRED File Manager. DB – the main database freddb – data of all domains, contacts, registrars, history etc. We have the logger database separately due to high workload. Consider that, ideally, this whole database should fit into the memory, which is possible only till a certain number of objects though. See also Storage considerations. extra space for garbage accumulation (before vacuuming), temporary dumps during migrations, and other db maintenance costs. Consider this the lowest requirement. This amount of memory might be filled quite soon. growth rate of the log records (according to the traffic estimation as described above): EPP ~ 135 GB / month, WHOIS ~ 30 GB / month.